OFFICE HOURS: Monday thru Friday 8:00a.m. – 5:00 p.m. CST. We are closed Saturday and Sunday. If no one answers please leave a message and we will be happy to return your call. We will be closed on all major holidays, and may even be closed the day before or after the holiday. RETAIL STORE HOURS: Monday thru Friday 8:00a.m. - 5:30p.m. CST, Thursday 8:00a.m. - 6p.m. CST and Saturday 9:00a.m. - 3:00p.m. Closed on Sundays. POINTS AND REWARD PROGRAM: When placing an order you are automatically entered into our Points and Rewards system. For every $1.00 that is spent you will receive $.03 off a future purchase. Each dollar you spend is worth 1 point. You can use your points on your next order or you can keep adding to your points to use for any future purchase. SHIPPING: For shipping and handling within the lower 48 states please see the shipping chart (prices subject to change due to fuel surcharges.) 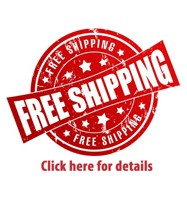 We ship UPS, USPS and Spee-Dee (Spee-Dee only delivers to Iowa, Illinois, North Dakota, South Dakota, Minnesota, Wisconsin, parts of Nebraska and parts of Missouri.) If you live within these states your orders will be shipped via Spee-Dee. Orders outside of these states that weigh less then 15 pounds will most likely be shipped via USPS and heavier items will be shipped via UPS. -Alaska, Hawaii & International orders pay actual shipping costs. We will try to fit your order into flat rate priority boxes if possible. If you would like to know the approximate shipping cost, please call or send us an email. -International orders will have additional charges once the package(s) reaches customs. Our shipping rates do not include these fees/taxes, we are unaware of what the amount will be. These totals are calculated by customs. The amount will need to be paid before the package is delivered to you. -If you would like your order sent Next Day, 2nd Day or 3rd Day, you will pay actual shipping costs, please contact us for shipping estimates. For an overnight shipping example: UPS charges roughly $40.00 for the first pound and $10.00 for every additional pound. These charges may vary depending on where the merchandise is being shipped to. 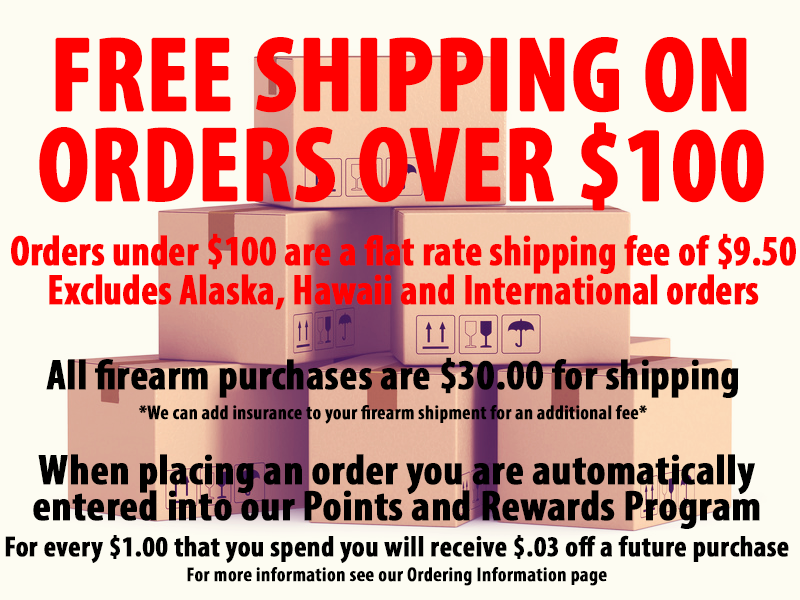 -All firearms purchases will pay $30.00 for shipping, you can add insurance to your shipment for an additional fee. INTERNATIONAL CUSTOMERS: We DO NOT ship any orders to package forwarding companies. Any order(s) placed shipped to any package forwarding companies will be canceled without notice. 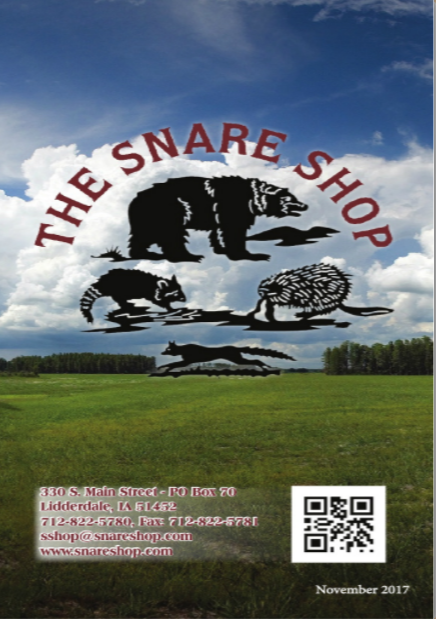 CATALOG REQUESTS: Our catalog includes everything we have for trapping, this catalog does not include any of our fishing or hunting merchandise. These items are currently only available online or in store. We are in the process of phasing out our printed catalog. Every catalog we print ends up in the trash at some point in its life. That's well over a million catalogs The Snare Shop has printed. Our wesbite has tens of thousands more products than we could ever imagine putting in a catalog. Catalogs are ONLY shipped within the US, we do not ship any catalogs outside of the US at this time. We can however include a catalog with your order. FIREARMS PURCHASES: When ordering a firearm you are responsible to know your laws. You must be at least 18 to purchase a long gun and at least 21 to purchase a hand gun. Federal law requires firearms to be shipped to an FFL dealer. Check with your FFL dealer for any additional fees they may charge to transfer the firearm to you and to make sure the firearm is legal for you to possess. When placing the order use your information for the bill to address and your FFL dealer for the ship to address. We need a copy of your dealers FFL before the firearm will leave our facility. Your FFL dealer will do all the transfer paperwork. All long-guns will be shipped regular ground shipping. All handguns will next shipped next day air. Make sure the FFL is sent to us as soon as possible. We will hold orders for 5 days and then the order will be cancelled if we have not received a copy of the FFL. SALES TAX: Iowa residents ONLY – add 7% tax. PAYMENT: We accept Visa, MasterCard, Discover and American Express. We also accept money orders and checks which will be held for clearance. There will be a $20.00 service charge on all returned checks. We do not accept COD’S. Payment must accompany the order. RETURNS/CANCELED ORDERS: All items returned must be unused and in their original packaging. Returns for store credit or exchange must be made within 30 days of purchase. A 20% restocking fee may apply to canceled and returned orders. Original shipping and handling charges are non-refundable. No returns on custom order, reference materials , lures and baits, or discontinued/on sale items. No returns are accepted on firearms or ammunition. Please contact us at 1-712-822-5780 before returning a product. NO RETURNS WILL BE ACCEPTED WITHOUT PRIOR APPROVAL. DAMAGE INSPECTION: It’s the buyers responsibility to inspect all packages upon receiving. Call us immediately if you find any damaged or missing items. You must keep the original packaging and damaged items for refund or replacement. Discarding original packaging will void refund. DIRECTIONS:From US HWY 30, turn north onto Quail Ave, go 4 miles and we will be on the south end of town on the west side of the road. From US HWY 71, turn east onto 150th St., go about 4 miles until you reach a stop sign, turn south and go 1 mile (through 2 stop signs). We are on the south end of town on the west side of the road.